We started the evening nibbling on cocktail shrimp and Jarlsberg on crackers. 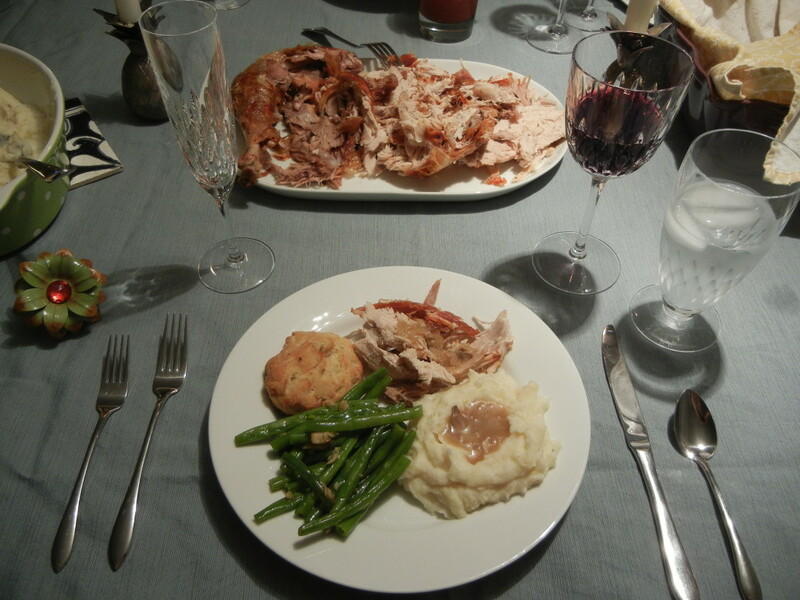 For the main feast we had deep-fried turkey, decadent home-made mashed potatoes, home-made gluten-free gravy (by Gravy Master Javi), home-made gluten-free biscuits, sautéed garlic green-beans, and 2013 Phebus MMC wine. (Yes, I’m using the term home-made excessively, but I’m unreasonably proud of all our made-from-scratch dishes!) We also had a champagne toast for Javi and Cait – they purchased their first home on Tuesday! We followed dinner with football and home-made pumpkin pie and whipped cream (also home-made). As mentioned in my previous post, this was my first attempt at a gluten-free dough. Wednesday night, with new recipe and gluten-free all-purpose flour on hand, I whipped up my first ever gluten-free pastry dough! Rolled it out with a little difficulty and discovered it was completely stuck to the wax paper below it. Attempting to separate the two while keeping the rolled pastry intact was not an option. Balled up dough, heavily floured the wax paper and tried again. As with regular pastry… you simply can’t roll it out twice. Tossed first ever gluten-free pastry into garbage. Vaguely recalled seeing frequent notes online about using saran wrap instead of wax paper. Round two went about the same. The dough seemed exceptionally sticky when removing it from mixing bowl. Heavily floured my hands, dough, saran wrap and rolling pin. Batch two wouldn’t roll out to the size of the dish without breaking apart. Even knowing it wouldn’t work, tried balling Batch 2 back up and re-rolling. Batch 2 went into the garbage. Before starting Batch 3, I reviewed my standard pie-crust recipe and decided to make a few small changes in technique, but not recipe. Batch 3 still came out of the bowl very sticky. Applied large amounts of flour, again. Was able to roll it out to approximately the size of the dish. However, the pastry was not strong enough to stay in one piece during transfer from saran wrap to pie dish. Since I was now out of gluten-free flour, I decided that the pastry was going into the dish, anyway. Pressed the torn parts together and puzzle-pieced in a few more scraps. It was exceptionally thin, with no extra dough for a pretty crust edge, but it was all I had. Adam, Cait and Javi all swear the pie was delicious, including the crust. I think it was difficult to even taste the crust, particularly because there was so little of it to compete with the spiced pumpkin filling. After talking with Cait about the troubles I’d had making/rolling/transporting the crust, she taught me something very important. Xanthan gum. If you’re making any kind of dough with a gluten-free flour, you’re going to want to add xanthan gum. That’s the part that helps the dough stick together. The recipe I’d used made no mention of xanthan gum. (This is the second time a recipe I’d found on AllRecipes.com failed me. I am not impressed and will avoid that site in the future.) Ah, well. I’ll know for next time! Hope everyone had a warm, delicious and joyful Thanksgiving!